The Where on (Google)Earth? quiz started on this blog back in January of this year has grown up and transformed into a community-based series. Many more geo-nerds are getting involved and the installments are featuring oblique views from time to time. I finally had a chance to solve one in time so now it comes back to me. The last one I did was #14 and this is #27!! I feel like a proud parent. My kid went off to bigger and better things and has now come back for a short visit. I can never tell anymore what is difficult and what is easy in WoGE. People seem to solve ones ridiculously fast in some cases. I didn’t include a scale on this screenshot…it’s a few miles across…or something. Those are the flatirons right outside Boulder, CO. Since I’ve been gone Wo(G)E has exploded! This is the first one I’ve won in a looooong time, so am I know in charge of #28? 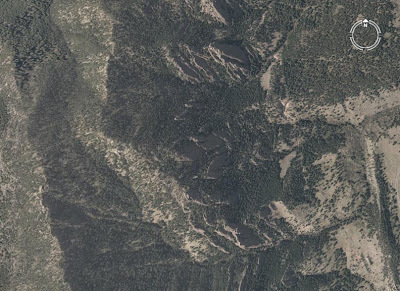 I’m afraid this is going to be one of those rediculously fast ones: Flatirons, west of Boulder, Colorado. Took me a minute to figure out where the sun was from the shadows, but once I figured that out it was a piece of cake. That’s partly because I’ve pored over this region in the past – the First Annual Virtual Globes Conference was held at the University of Colorado at Boulder last summer. You can see the flatirons in the background of the group photo from that conference. Looking at the timestamp, both Thermochronic and Ron came in at 9:28am…but, I have to honor blogger.com’s ordering and give the WoGE #27 win to Thermochronic. Yes…#28 is yours…and welcome back. Bye bye, WoGE…come back soon. Next time I won’t be so verbose. D’oh!… That’s #28 that I’m happy to see Thermochronic posting. YES! I am doing a victory dance right now. Too bad I can’t answer my own Wo(G)E, then I could go on a winning streak. I am trying to decide on the location, stay tuned…..